1. If a little kid decides that your book is less than enthralling and decides to throw it on the ground and stomp on it repeatedly, YOU MUST NOT PUNCH HIM. I know it’s tempting, but you just can’t do it. 2. 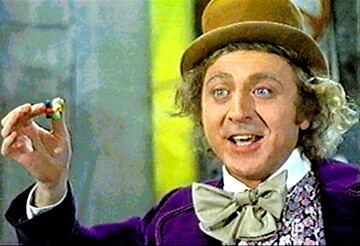 Dressing up like Willy Wonka does seem to draw in the kids. Maybe it would work even better if I give away candy…if not, I can always eat the candy myself. 3. If the kid throwing a tantrum is louder than you, you will likely lose your audience. Scream at the top of your lungs if need be. 4. If the only people who show up for your book signing are relatives, pretend that you don’t know them. That way, people will think that you are more popular than you really are. Of course, it is possible that the old man was simply senile, in which case, I feel terrible for making fun of his condition. 5. No matter what your story is actually about, just throw in a few words about world peace and watch your profit margin grow!!! Well, that’s the end of the lessons for today. If any of you have advice to share about author readings or book signings, please feel free to share!